Cloud Cuckoo Cottage01263 715779work01603 870304fax Self-cateringThis skillful renovation of a traditional fisherman's cottage sits only a short stroll from Cromer's fantastic beach. Set over three floors, the cottage is cosy and provides a relaxing home away from home for visitors to unwind and is perfect for young families or couples. From the small courtyard garden at the front there are sea views and the cottage also welcomes a dog. There are plenty of attractions for groups and families to visit in Cromer, including an excellent golf course, museums, a small zoo, climbable church tower and some great pubs and restaurants. Cloud Cuckoo Cottage offers weekly bookings starting on Saturday. 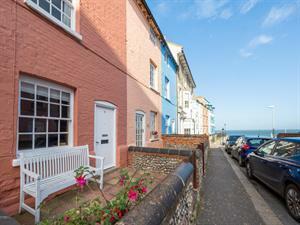 This skillful renovation of a traditional fisherman's cottage sits only a short stroll from Cromer's fantastic beach. Set over three floors, the cottage is cosy and provides a relaxing home away from home for visitors to unwind and is perfect for young families or couples. From the small courtyard garden at the front there are sea views and the cottage also welcomes a dog. There are plenty of attractions for groups and families to visit in Cromer, including an excellent golf course, museums, a small zoo, climbable church tower and some great pubs and restaurants.